Cold-applied, self-adhesive membrane for protecting structures against the ingress of moisture and methane and radon gases, comprising a specially developed high strength composite film laminated to a self-adhesive polymer modified compound. When used in conjunction with Gastite DPC and preformed cloaks the membrane forms a complete gas-resistant system. Laminated metal foil and modified bitumen compound provides dimensional stability, high tear strength, puncture and impact resistance. Cold applied: No heading equipment required, so increasing site safety. Specification compliant with the requirements of BS 8102. 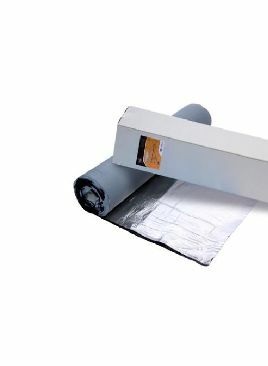 Can be used as a damp proof membrane. 0.1 g/m² per 24 hours.